London, with an Introduction by Hilaire Belloc, Duckworth and Co and Brentano’s, London 1909. Folio, 20 photogravures. Apparently the Olympics are coming to London soon, so with this in mind and also with the more interesting prospect of a new, glossy, authoritative study by Pamela Glasson Roberts out soon from Thames and Hudson, it’s time to visit the work of Alvin Langdon Coburn, dubbed by George Bernard Shaw 'the greatest photographer in the world'. Coburn is the big hitter among art photographers-- the man who was the first to create art out of the humble topographical photograph. 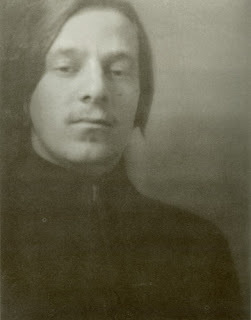 But as well as his well captured portraits and urban landscapes of London and New York , he later experimented with ‘Vortographs’, which makes him especially fashionable now that Futurism and Vorticism are currently very hot indeed. Alas, at the height of his powers he retreated to Wales, where he became embroiled in Freemasonry and the occult. He died almost forgotten in 1966. Despite its size London looks superficially like a standard Edwardian chatty topographical book of which there are so many-- the sort of book you might find at the bottom of a tea chest at some obscure country sale, or at a jumble sale in the Cotswolds. The title page tells you that the text is by Hilaire Belloc. It could just as easily be by Edward Thomas or E.V.Lucas, or indeed George Bernard Shaw, who was originally approached to supply the Introduction. It is only by opening the book and flicking through its pages that you discover its true qualities. 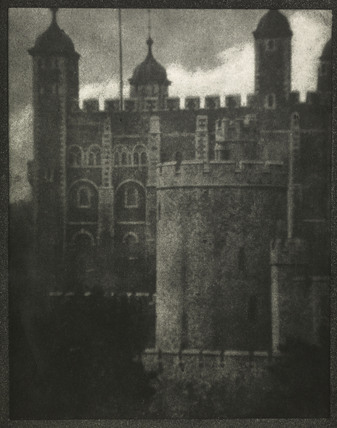 The photogravures are stunning. Even if you didn’t know Alvin Coburn from Alvin Stardust you’d be enchanted. An American from Boston, Coburn fell in love with photography after being given a Kodak as a child of 8 in 1890. At 17 he accompanied his photographer cousin F. Holland Day to London, where nine of his plates were included in an exhibition at the Royal Photographic Society. In 1904 he held his first one-man show in New York City as well as having a photogravure published in Stieglitz’s magazine Camera Work. 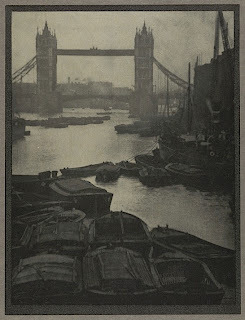 He subsequently made other visits to England, taking photographs of the capital and studying the photogravure process at the London County School of Photo-Engraving, before settling permanently in the metropolis in 1909. He had already been commissioned by Brentano’s and Duckworth to create twenty plates for a luxurious coffee-table book on London and after building two hand-operated printing presses in his new home he immediately set about putting all his new engraving skills into practice. For London he personally prepared the plates, creating proofs from them until he had created the perfect plates for his printer to match. He also supervised the printing. The appearance of London created a sensation. Never before had the British seen their capital is such romantic light, though William Hyde’s London Impressions had done something similar in 1898; nor had buildings and bridges been photographed from such elevated positions. Coburn’s image of Tower Bridge, which had only recently been opened, is unforgettable. Other publications in which Coburn was involved are equally expensive today. New York, the follow-up to London, which contains an iconic photogravure of Brooklyn Bridge, can go for even more, that is if you can find a copy. Many copies of both books must have been broken up for framing, which may explain why only two complete copies of London are currently for sale online at £11,000 and £15,000. More common are the many annual editions of Coburn’s Men of Mark series, which range from $3,000 for issues featuring middle-ranking figures, to $17,000 for the 1913 issue that contains portraits of big names like Bernard Shaw, W. B. Yeats and Mark Twain. Copies of Camera Work also range from $1,500 to a staggering $3,500 for the 1906 issue, although with all these fragile publications condition is an important factor. Many copies, notably one on Abebooks, for which one chancer requires $2,000, have damaged spines, and others may be dog eared or have pages creased. They are, after all, essentially magazines. Perhaps the best current online Coburn bargain at $1,250 is a copy of The Blue Grass Cookbook (1904), an unremarkable book in many respects, but notable for being the first in which his photographs appeared. It is basically a celebration of southern USA cuisine and of those women who perfected it. Somewhere I have seen a little masonic book with Coburn wearing the dress of the order and looking about as Bohemian as John Major. It seemed curious he had once been a wizard of the lens right up there with Sander, Emerson, Ray and Stieglitz. In the early 70's I worked for a bookseller whose reserve stock included a smallish remainder (6-8 copies) of London. Do not recall what was asked for a copy. A year or two later a US dealer offered me the first two volumes only of the deluxe issue (copy #2) of the New York edition of Henry James' Works, each volume inscribed by James to Coburn. I decided I had better, tho' non-essential, use for the $500.00 asked. A warning to you all. That Thames picture looks Dickensian. I take solace in the fact that I would have sold it a few years later, with my small James collection, for a fraction of what it would now be worth. I DID own (sold!) the copy of the two-decker Confidence (considered by some scholars to be his worst novel) that James presented to Turgenev. Now, I recently discovered, in the open stacks of the US library that bought the books. These pictures are not exactly what I was looking for. But if speaking about Olympics, can you tell me top water sports in London?